The countdown has begun at Heiser Ford Lincoln, Heiser Toyota Scion, Heiser's Quick Motors, Heiser Chevrolet , and Heiser Chevrolet Cadillac. Right now, ring in big savings at Heiser’s Year End Sellabration: No Payments For 90 Days0% APR FinancingBonus Cash$500 More For Your Trade!And, Exclusive Heiser Discounts! Year end means we need to clear our lots of inventory. Check out our online pricing for the best offers from Heiser. And, with the recent announcement of incentives OVER AND ABOVE their monthly specials, this really is the time to visit Heiser! A New Year’s Message from Mary Ann. Lincoln and its dealers have launched a new program called Driven To Give. Driven To Give is designed to help raise much needed funding for local community groups and nonprofit organizations. On Saturday, December 14th, 2013, Heiser Ford Lincoln and the alumni of Marquette University High School came together to honor their late friend Grady de la Cruz. At this event they raised thousands of dollars via 217 test drives and many generous donors for the Grady de la Cruz Memorial Scholarship. Test-drive fundraising event generated much-needed money for the Dominican High School Girls Basketball Team, helping support the local community. 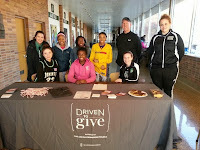 ﻿Heiser Ford Lincoln, Dominican High School and members of the local community raised over $3,000 for Dominican High School’s Girls Basketball Team at a recent test-drive event, as part of Lincoln’s Driven To Give program. More than 100 White Fish Bay area residents test-drove an eligible Lincoln vehicle at Dominican High School last Saturday, December 7th, 2013. Heiser Ford Lincoln and Lincoln donated $20 per test-drive up to $6,000, with funds going towards the 2013-2014 Dominican High School Girls Basketball Team’s season. Choosing an auto shop isn’t always easy. Fortunately, the outstanding quality of work Milwaukee auto body customers find at Heiser makes it an easy choice. On the wake of our first large Southeastern Wisconsin snow storm, Heiser is here to help automotive consumers in need. After a collision, making a poor decision when choosing a shop to carry out your vehicle’s repairs can add unnecessary hassle to an already stressful situation. By choosing Heiser you are choosing a reputable body shop to get back on the road as quickly and easily as possible.